The Okapi framework is a set of cross-platform tools and components to help in translation and localization tasks. Those applications are built on top of Java libraries that you can also use directly to develop your own programs and scripts. The framework is useful to develop workflows to process files before and after translations, or to perform different tasks on translation-related data at any point. For example, you can use Rainbow, one of the tools built on top of the libraries, to prepare for translation documents in many different formats, and to post-process them after translation. It supports the creation of different packages you can translate using tools such as OmegaT, Virtaal, and even commercial tools. Other utilities include: encodings convertion, source-target text alignment, pseudo-translation, translation comparison, RTF conversion, search and replace, and more. The framework allows also to create new utilities easily using a pipeline mechanism. 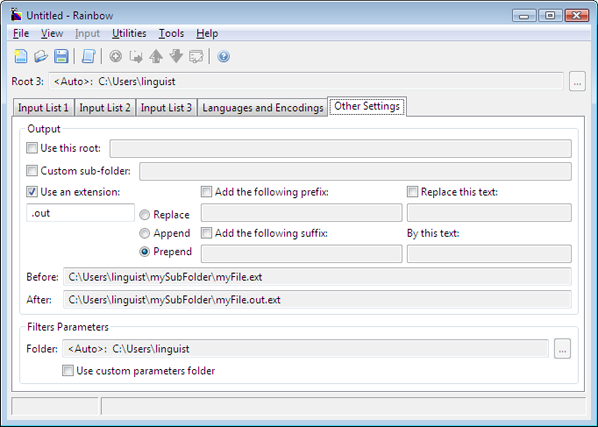 The framework provides a collection of filters. They all have a common API and can be used to perform different types of actions on the translatable content of many different file formats. The filters include support for formats such as HTML, XLIFF, TMX, PO, XML (supports ITS), OpenOffice.org (ODT, ODS, ODP, etc. ), MS Office 2007 (DOCX, XSLX, PPTX, etc. ), Properties, CSV, and more. Additional formats can be supported by defining custom configurations, for example using regular-expressions based parameters.